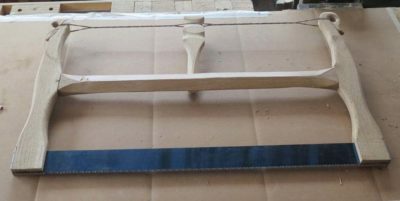 With Roubo Joinery Bowsaw Prototype tested in battle and found wanting in the lightness department, it was time to think about ways to reduce the overall weight and bring that down to a point I was comfortable with. 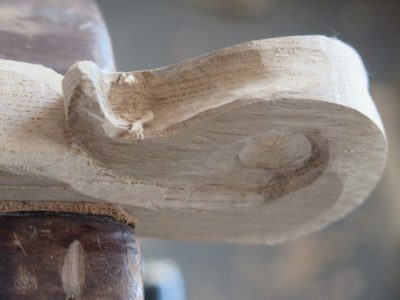 As it was now, it was a massive beast that was simply too heavy to use as a one-handed saw for cutting tenons or dovetails. I rounded all the edges substantially, but that was not enough weight reduction. I sculpted the tops of the arms, it was pretty but insufficient. I transformed the stout cross-bar into a diamond cross-section with tapered chamfers providing the transitions. Nyet. It wasn’t just a smidge heavy, it was a couple pounds too heavy. Achieving any more mass reductions would have been quicker with a new starting point since I had obviously selected the wrong one here. Since Bad Axe had sent me some new plates to my specs, that’s where I went next. 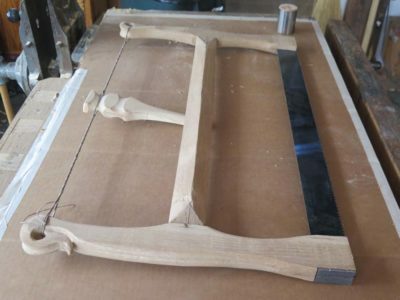 We’ll see if 3/4″ white oak stock is up to the task of restraining these plates, or if I need to address this frame again with acres of carving and other diminutions. At the very least, with 3/4″ stock I would start with a 40% reduction in weight, so the idea was promising. In France, (old catalog La Forge Royale) : arms in “service tree”= sorbus domestica. Ulmia: beech arms and Hornbeam stretcher. 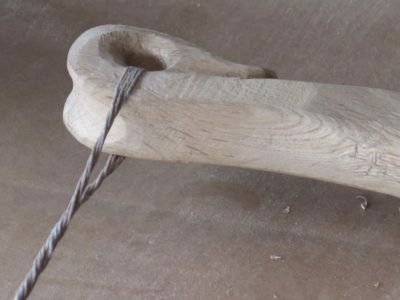 Saws from Dictum: cedar stretcher, arms not specified. I don’t know how much it would help save weight, but in the Blackburn Tools Danish Frame Saw plans, they recommend a lightweight wood for the stretcher. IIRC Roubo mentions pine as the stretcher, so perhaps I will find myself there before it is all over. I’ll be working on the second prototype today. Don, I’m looking forward to seeing how all this turns out. Thank you for letting me see your experimenting.